They survived what no woman should ever have to endure. Now these three women have the means, the opportunity, and the perfect motive. Are they trying to get away with murder--or is someone trying to make sure that this time they don’t get away at all? The Survivors Club. . .that’s what Jillian Hayes, Carol Rosen, and Meg Pesaturo call it. They won’t consider themselves victims. They are survivors. They faced the blazing headlines and helped lead the investigation that caught the man who changed their lives forever. But questions taunt Griffin: Who ordered the deaths of Eddie Como and his killer? Could three ordinary women have been driven to do he unthinkable? 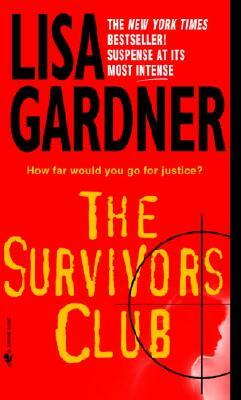 Had someone in the Survivors Club become a killer? Griffin seeks the truth--and finds himself confronted with the leader of the Survivors Club. Jillian Hayes is beautiful, successful, cool as ice, and she harbors a pain that mirrors Griffin’s own. Did the horror of what happened to her push her over the thin and desperate line that separates survival and revenge? And if it did, could he blame her--or anyone in the Survivors Club? Then another woman is brutally attacked. Lisa Gardner is the "New York Times" bestselling author of The Next Accident, The Other Daughter, The Third Victim, and The Perfect Husband. She lives with her husband, Anthony, and their two dogs in New England, where she is at work on her next novel of suspense. "The Survivors Club has it all -- provocative plotting, an astute eye for detail, engaging characters, and a razor-sharp emotional edge."